Simply pick a corner of the HydroSheet and carefully lift it away from the wall. The old wallpaper should come away with it. 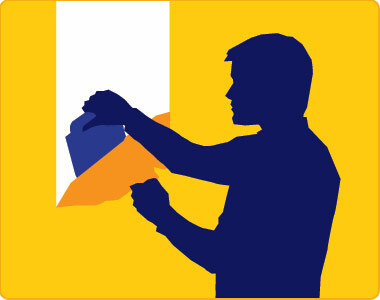 Peel diagonally across the wall until you have a complete strip, then peel carefully downwards. The HydroSheet provides support for the old wallpaper, reducing the likelihood of tearing. Most times it should all come away in one piece. When you have finished, simply lift the old wallpaper strips from the HydroSheets and dispose of them. You can reuse the HydroSheets, so just rinse them out and let them dry. Discover how to save time & money! SimpleStrip Professional 2011. All rights reserved.